A calf sling with hanging scale to weigh newborn calves. 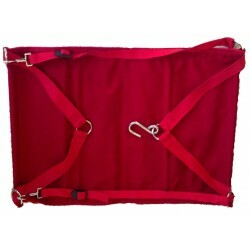 Sling is custom made with stiffening supports to prevent the sling from bunching up. 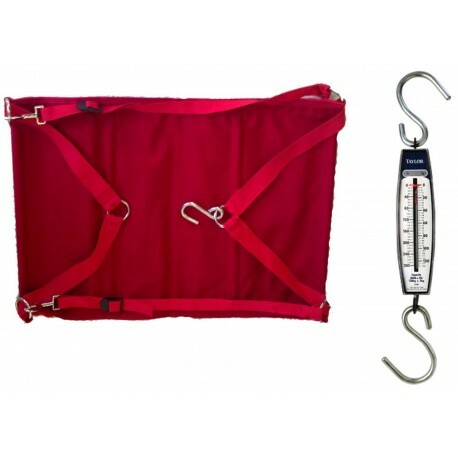 Each sling includes two removable straps with snaps that can be used to further secure the calf. Sling is 17" across and 24" long. Comes with hanging scale with 280lb capacity. 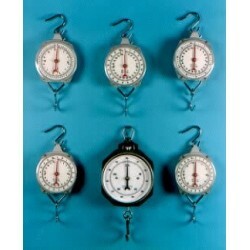 Hanging scales are accurate, strong and handy for use around the farm and shop in addition to their use as milk scales. 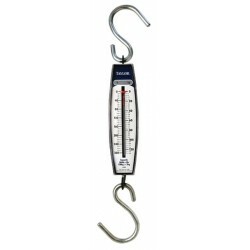 280 lb./128 kg capacity scale is equipped with S hooks for both the top and bottom of scale. Scale has durable steel housing and is easy to read with red pointer. Scales are portable. This model will weight up to 280 lbs. Both scale and sling are also sold separately. See 'Related Items' tab.